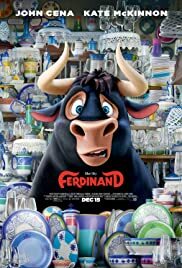 I liked Ferdinand. He’s a sweet creature, and given the casual violence in a lot of cartoons and superhero shows and etc it was refreshing to have a pacifist protagonist who isn’t a coward, he just doesn’t want to fight. Although I liked Ferdinand himself, Lupe really stole the show–she had most of the best lines and Kate McKinnon’s delivery made them all the better. But, my goodness did I find this movie depressing. The characters were all fine, but the situation they’re in, where they’re all competing for the right to be in a bullfight where they will be baited and wounded for no better reason than to force them to be violent to fight harder in a fight that they cannot possibly win, and will be killed at the end of. The alternative is showing that they can’t fight at all and getting sent to the butcher to get turned into meat. The movie’s fine, though it’s nothing spectacular like Pixar film would be. But the background scenario is just so bleak, I had trouble getting over it when I was expecting this to be a light kid’s film.